Bunting and flags for the festival. Four Kindy classes stamped, stencilled, dotted and rollered indigenous inspired imagery onto cotton cloth, using fabric paints. Everlasting flower cushions. 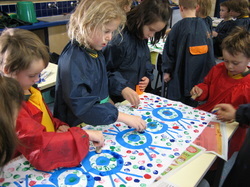 Three pre-primary classes learnt the hand felting process to produce petals for the cushions. A busy bee of parents assisted in constructing the cushions. Wildflowers Two year 1 classes hand felted flowers to create their own wild flowers inspired by those growing in Kadajini Park. The stems are cane wrapped in fabric, with recycled plastic bottles cut and heat gunned into the supporting flower head. Decorated generously with pom-poms and acrylic felt pieces. Giant Dreamtime Wagyl Snake (Rainbow serpent) Two year 1 classes and two Year 2 classes learnt the art of screen printing with cut stencils. 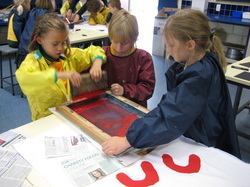 They then progressed to the RISSO (Thermofax) stencils, each child printing their own imagined indigenous symbol, completed with dot stamping. The fabrics were sewn together to form the snake and stuffed with recycled two litre plastic milk bottles. Indigenous leader Ingrid Collard gave us permission to make the Wagyl snake. 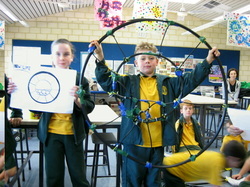 Giant Turtle Using the basketry technique of 'coiling', J4, a Year 2 class wrapped rope with knitting yarn to create the coloured coils. The turtle armature is made of pliable cane and the coils were stitched onto the frame. It was a little tricky for year 2's to start a new yarn and keep the tension tight. Felted Map of the New Playground M4, Year 3 students leant the wet felting technique, they cut abstracted shapes from pre felts and stitched them onto the thicker wool batting before felting the whole piece together to create this wall hanging. Wind catchers M3, Year 3/4 were discussing environmental issues that may effect the park and made wind catchers to represent their concepts and wishes for the future. The shapes are made with flexible reticulation pipe, wrapped in newspaper, then cellophane. The decorative finishing touches are mirrors, ribbon and beads. Stitched lizard. Year 3 class, M2, had a practise piece of hessian to stitch lizard skin and animal markings, stitching was new to many of them. We used large blunt needles and donated tapestry yarn to complete another piece of hessian that formed the top of the lizard. The final 'cushion' was stitched closed by parents and stuffed vigorously with wadding by the kids. 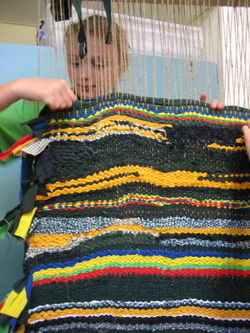 Spiral weaving. The kids originally envisioned weaving between recycled bicycle spokes to illustrate environmental issues related to cars, instead we fashioned our own using hulla hoops and cane. Hay birds. Kadijini Park kept its old trees when the community won to save the park as public open space. 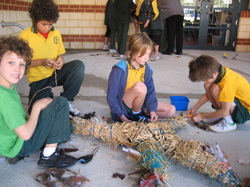 Local issues relating to the destruction of habitat for the black cockatoo inspired the kids to make birds. Sticks and stitched hay form the bodies, which are decorated with feathers and acrylic felt. Costumes - Spirits of the Park and the Protectors. 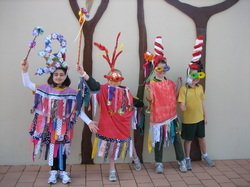 Students in this class were keen to make costumes for a performance. The year 4 students developed a skit around the demolition of the old school, the Warriors made sure that all the heavy machinery had finally left the site and summoned out the spirits of the park to restore the insects and flowers. Far Away Tree. To acknowledge and celebrate the mature trees that were saved when the site became a park, the class decided to make a very special, magical tree. Cane armature is covered with paper mache for the trunk and all recycled materials are used for the leaves and flowers. The Protectors of the Park. Year 5 students made two mystical protector beasts that would guard the park from any future harm. Drawing using the 'Exquisite corpse' game produced the look of the beasts. The internal structure is all cane with paper mache skin and painted. Weaving. Class S4, acknowledged the (demolished) old school by weaving the history of the school's uniforms, past to present. 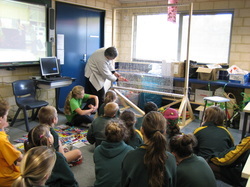 Tapestry artist, Antoinette Carrier spoke to the students about weaving and demonstrated warping up the loom. Painted canvas. Year 6's were inspired by the paintings and illustrations of local artist Rebecca Cool. 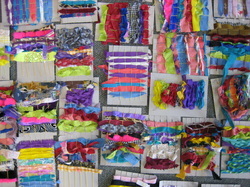 A technique of combining fabrics with paint on the canvas. 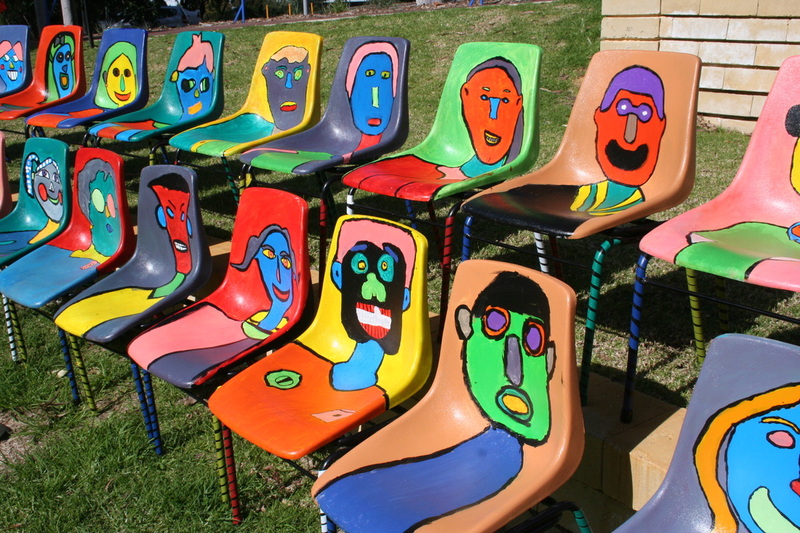 Painted Chairs. ​Year 7s researched students that attended the primary school in the past, they each adopted a student making a blind contour portrait to use as a guide. We used black outlines and block areas of colour to unify the results. The chairs were symbolic of the memory of a class no longer present. ​Our eldest class ( the Year 7's) boiled up sticks, leaves and nuts from the old school site to produce natural dyes to colour cloth. Dyed cotton, silk and wool blanketing were pieced together to replicate a satellite view of the old school. To achieve the lavender colour to represent the Jacaranda trees we dyed silk with red cabbage. 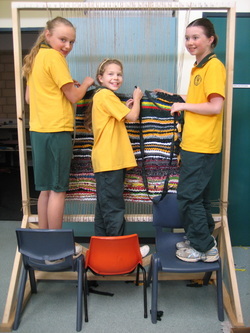 Tapestry wool was used to stitch details such as grass, flowers and the basket ball courts.